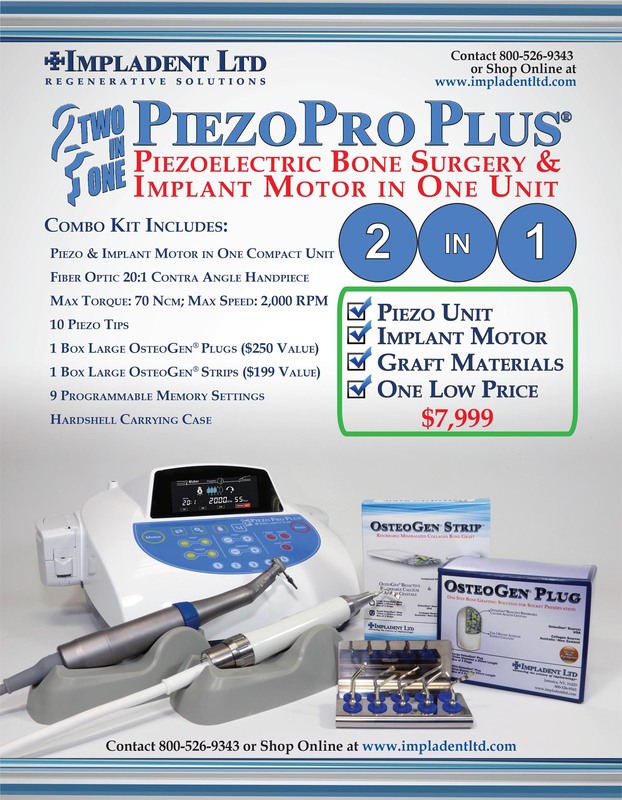 Impladent Ltd. is proud to introduce the PiezoPro Plus ® Two in One Piezoelectric Surgery and Implant Motor. The two in one compact design saves space in your crowded office, saves the time it takes to switch between machines and saves money as the unit is up to 50% less expensive than other comparable brands. The complete set not only contains a piezo handpiece with 10 tips and an LED contra angle handpiece for implants, but also includes nearly $500 worth of bone grafting products including our award winning OsteoGen ® Bone Grafting Plugs and OsteoGen ® Strips – all for only $7,999. Ultrasonic piezo technology cuts bone without damaging soft tissue which allows accurate and precise cuts facilitating surgery and reducing postop pain and discomfort for your patients. 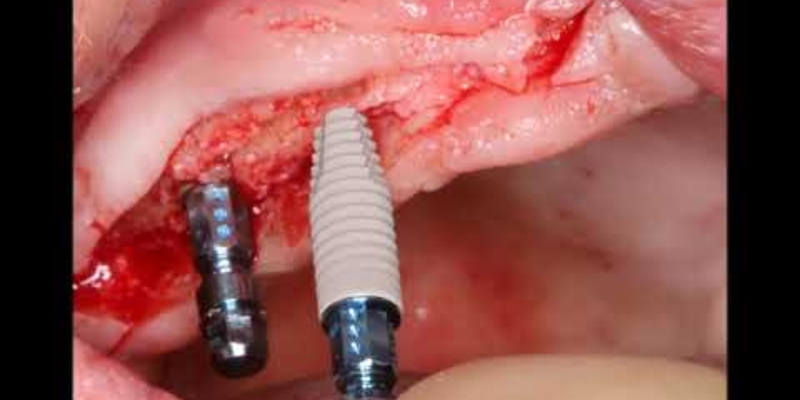 As soft tissue is protected, the risk of Schneiderian membrane perforation during sinus lifts is reduced and implant site preparation can be performed with less risk to the inferior alveolar nerve. Additionally, bone can be preserved during extraction of impacted or ankylosed teeth with less facial swelling postoperatively. 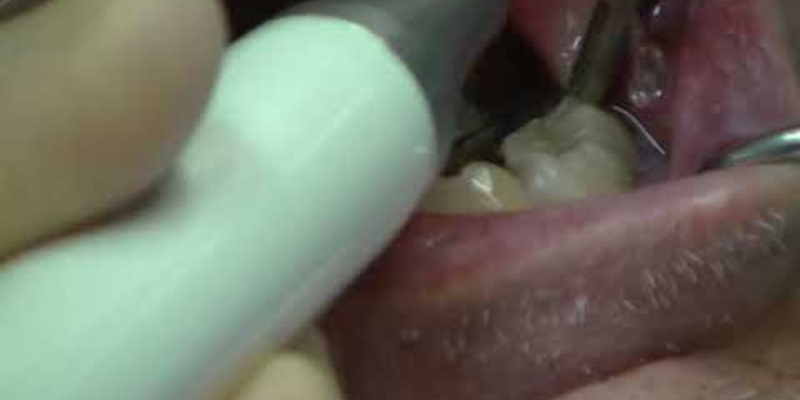 Finally, the tips included offer maximum surgical control during the harvest of autogenous bone and block grafts from the mandibular ramus and chin. The piezoelectric microvibrations are atraumatic to surgical site, cutting bone without necrosis of the surrounding area. The PiezoPro Plus ® dual piezo/implant motor has a stable, yet powerful output with an LED screen featuring up to nine pre-programmable settings. Switching between the Piezo and Implant motor functions is seamless via the large buttons on the control panel, or by using the included foot petal. The LED contra angle handpiece has a total of 8 gear ratios including 20:1 producing up to 70 Ncm with a max speed of 2,000 rpm. The control panel displays actual speed and torque values and includes an automatic overload protection system that will stop the machine if necessary or if the piezo tips are installed incorrectly. The unit features an auto-calibration function and displays the most suitable output for each ultrasonic tip used. Ten piezo tips are included with the kit with duplicates provided of the two most popular tips. Finally, a stainless-steel sterilization cassette for the handpieces and cords is included along with a hardshell carrying case which fits all the components.